Scout hut in use until then, so that will be our first meeting of 2019. This week being the 11th of October. Wow – haven’t posted anything on here for absolutely ages, but we do still meet as a club every Wednesday night, as advertised. Come along if you are interested. I should probably add a contact us form while I’m at it – I’ll see what I can do. Haven’t posted anything for ages I realise, mainly because I have been away on business a lot recently, but we are still here and meeting every Wednesday. No club next week as the scouts are having a jumble sale in the hall. Normal service will be resumed on the 22nd. Another great game of Maurice last night, although not sure if Dave would agree with that. Really enjoying the rules and the constraints imposed by the cards: I did a big assault to try and break his line at one point and found my assault getting more and more desperate as I threw in more and more units to keep the pressure on him but was running out of cards. Finally broke through the infantry but had a hole in my line, he had cavalry opposite and I had no cards left so I had to stop and draw more before I could bring up my reserves. Fortunately Dave didn’t exploit the gap and used the move to protect his flank but I think if he had I would have lost the game. real general and also gives those pause that battles seem to have while nothing happens. All in all a set of rules I am really loving. And the 6mm figures are looking better than I thought. First the BwX. These are from the Outpost Ching/Manchu range. 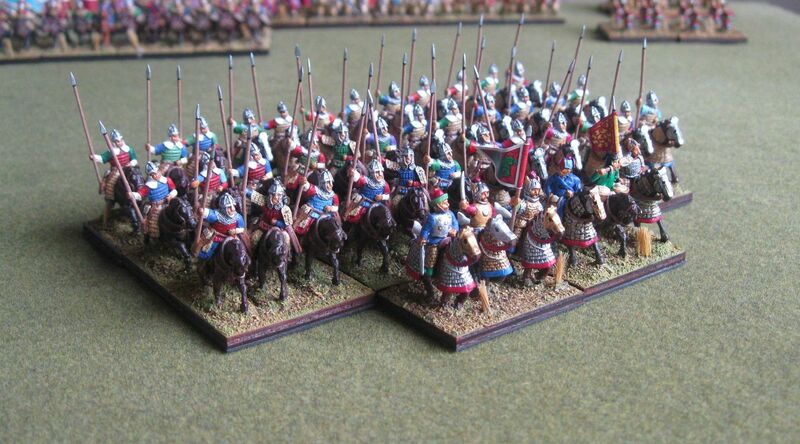 Quite nice figures in brigandine armour. 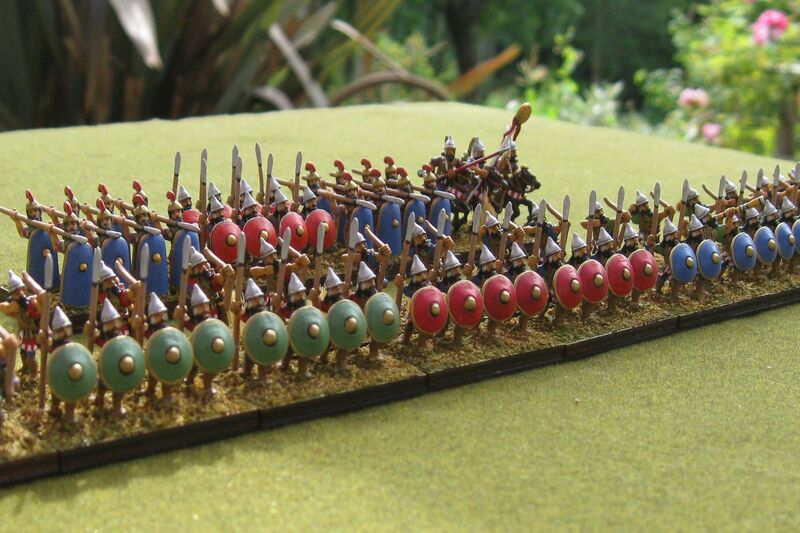 The shields are scratch built from plastic – probably too big, but I wanted 2Sp/2Bw on the base (as single based BwX) and narrow shields looked wimpy. 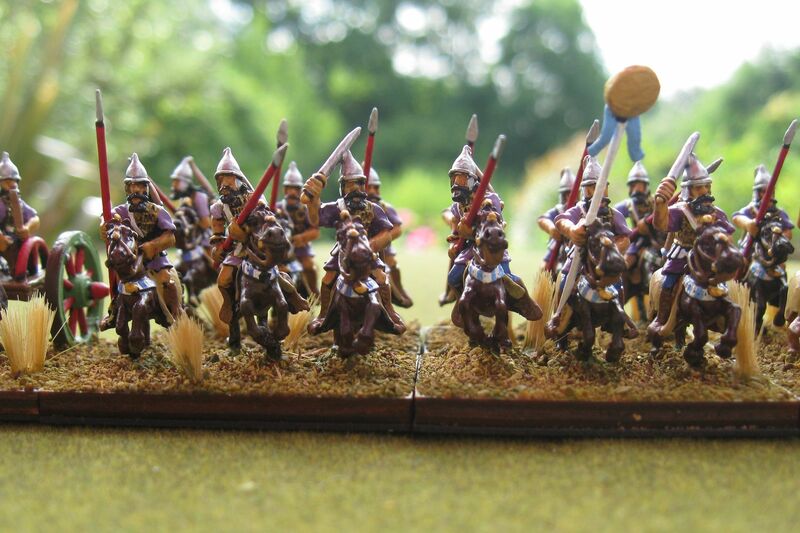 Next the Halberders (BdO). 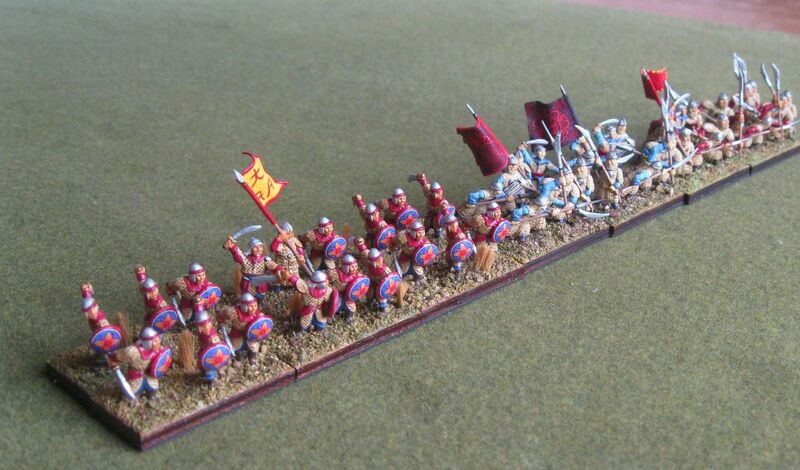 I like these guys- lots of movement- but the figures are big and it is hard to squeeze four on a base. 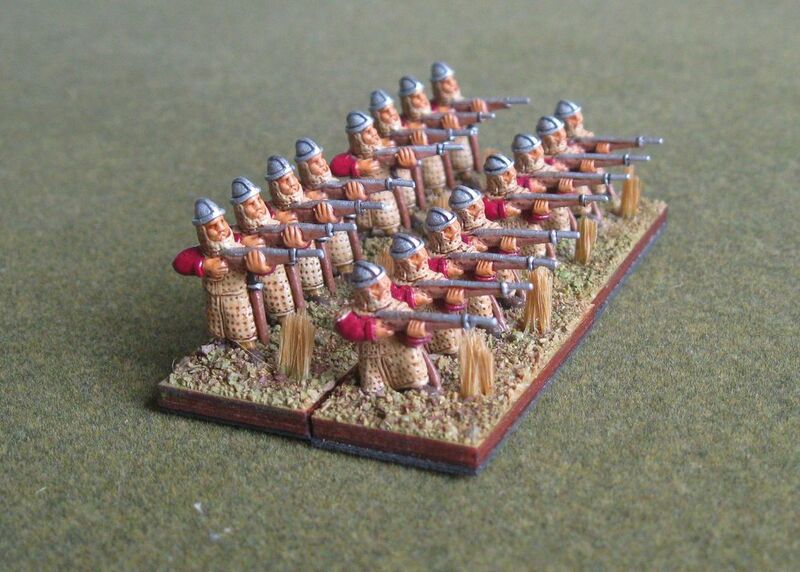 I replaced the supplied halberds with something more substantial. The blades are made from 0.9mm bore syringe needles, flattened and curved with pliers and then filed down. You have to file the points down or they can cut large gashes in your fingers…. 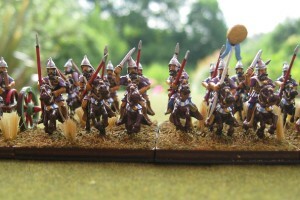 These are the Outpost swordsmen (BdF). The shields are transfers from LBM – I think the flower is from one of the Byzantine sheets. 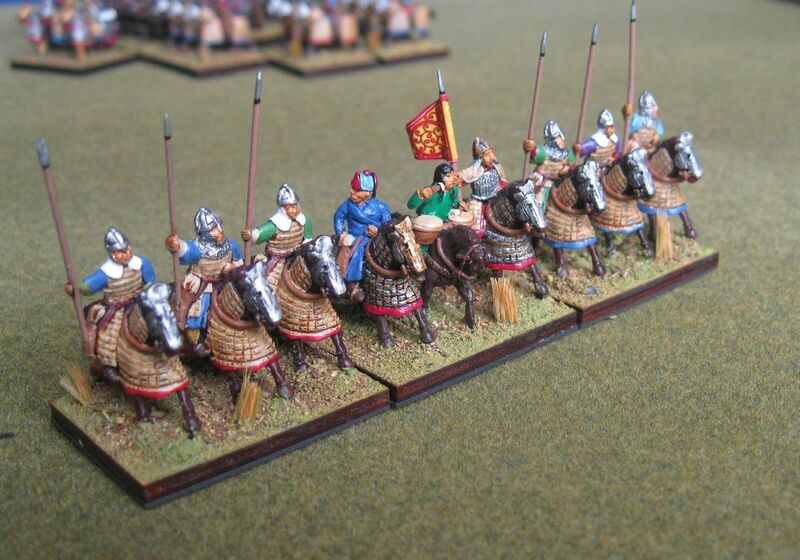 These are fairly versatile figures that often double as generic eastern auxillia. Lastly some handgunners (PsS). 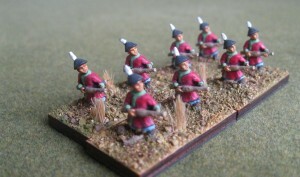 I decided not to take PsS with the Ming (too many better goodies) but I use these in the Yuan version of the army. The figures are from Grumpy miniatures that I picked up from East Riding miniatures many years ago. 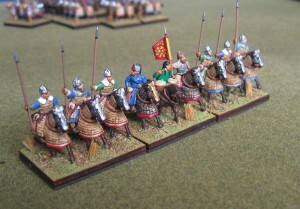 Lancers (KnF) and mounted swordsmen (CvO) from Outpost. 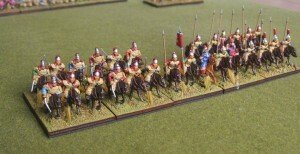 A general with some heavy cavalry (CvS). These are from the Outpost Turkish ranges. 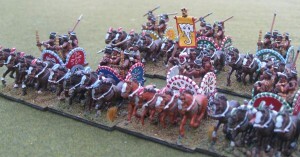 Massed CvS and some unarmoured (CvO) horses above. 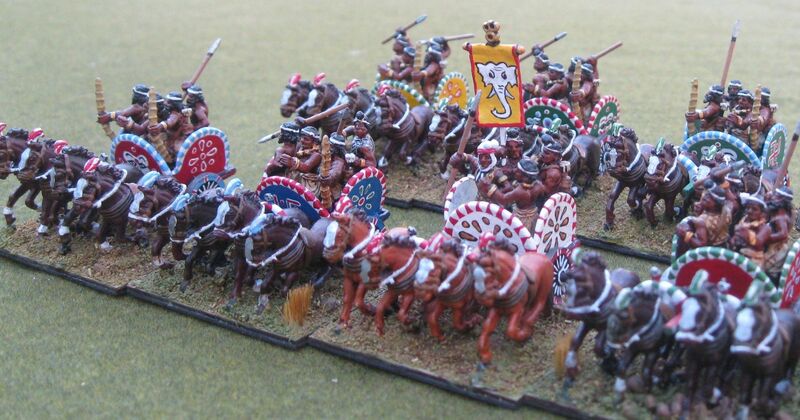 Heavy cataphracts. These usually are fielded in the Sui/Tang versions of the army, though I think the figures on the general’s element are from the Toullier Korean range. 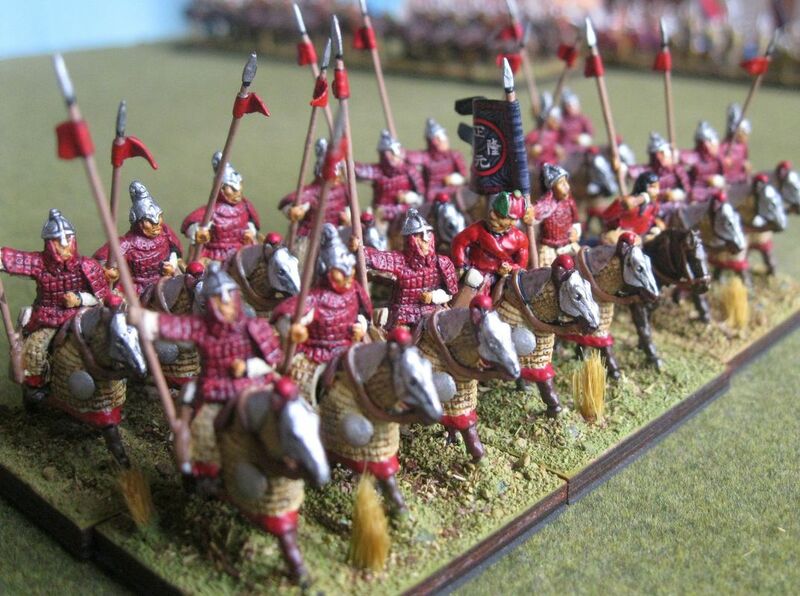 Light horse – the first are Mongols from the Manchu range, the second are MoHo from the Tang range. More Grumpy miniatures below. 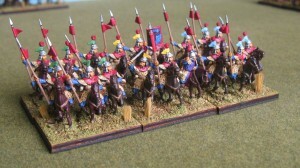 I much preferred the mounted to the infantry – most of which I still haven’t painted up. The Ming heavy cavalry are nice though- I love the little flags they have on their hats! The halberd armed CavO are also nice. 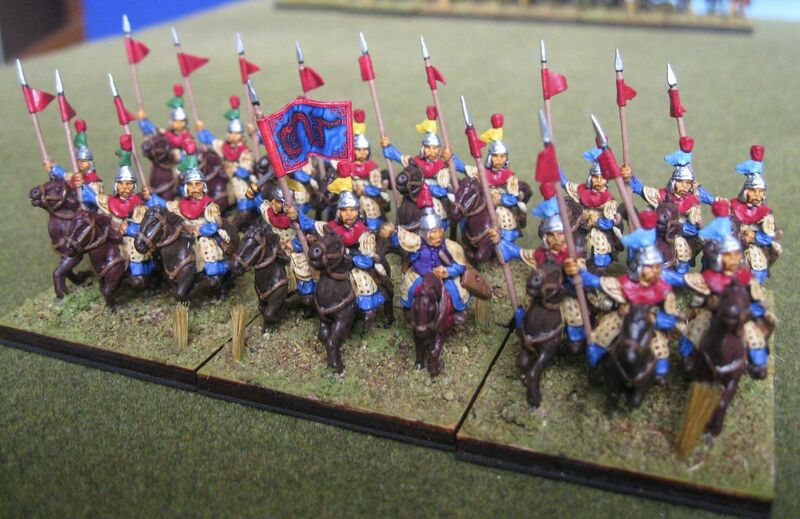 I like the halberd – it gives a nice way to differentiate troops clearly on the table – CvS with a lance, CvO without. Lastly the camp. For Warfare I wasn’t taking fortified baggage, but I made this lot for the Tang (who usually do). 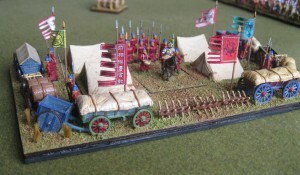 The tents are from Baueda, the wagon laager is mostly from Hallmark (supplied by Magister Militum) and the banners are LBM transfers. The baggage guards and the officer are probably from the Outpost Tang range. It represents 6 x BgO surrounded by 7TF. 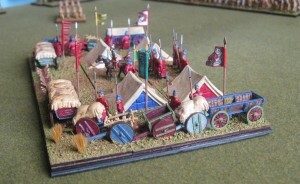 The wagon laager obviously works since I don’t think the baggage has ever been sacked…. 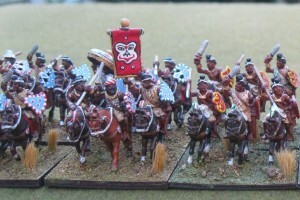 I was playing Toby on Wednesday and had dug out some of my indian figures for him to use in a Later Muslim Indian army. I hadn’t used the Indians in about three years. Under the old DBM lists the chariots were rated as iKnS – which made them very powerful. The new DBMM lists have them as iKnX or iCvS which is far less attractive. 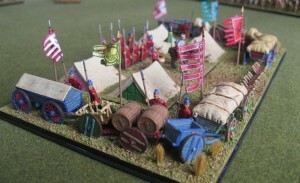 Although the army is pretty powerful frontally, there are hedgerows that can outmanoeuvre it and any competent opponent can rip it apart fairly quickly. It is pretty though…. 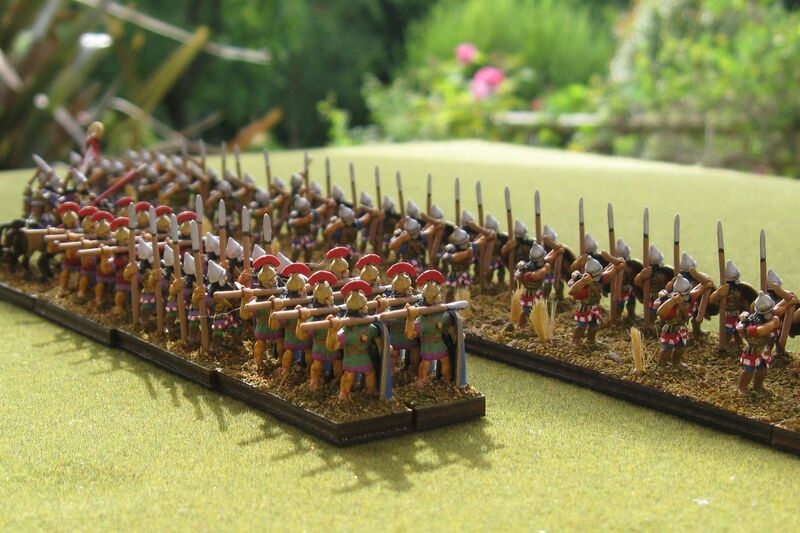 All the figures are Xyston – probably my favourite manufacturer. 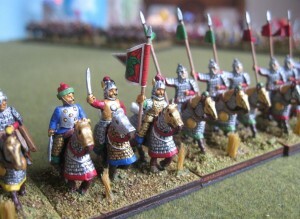 The figures are superb- lots of detail, and with lots of variety in each pack. Sticking on shields/spears increases the variety of poses even further. The archers in the pic above are Mountain Indians, as are the tribesmen to their right. Solid figures who reappear in many guises when needed (especially the tribesmen who morph between PkF/Ax/BdF etc). 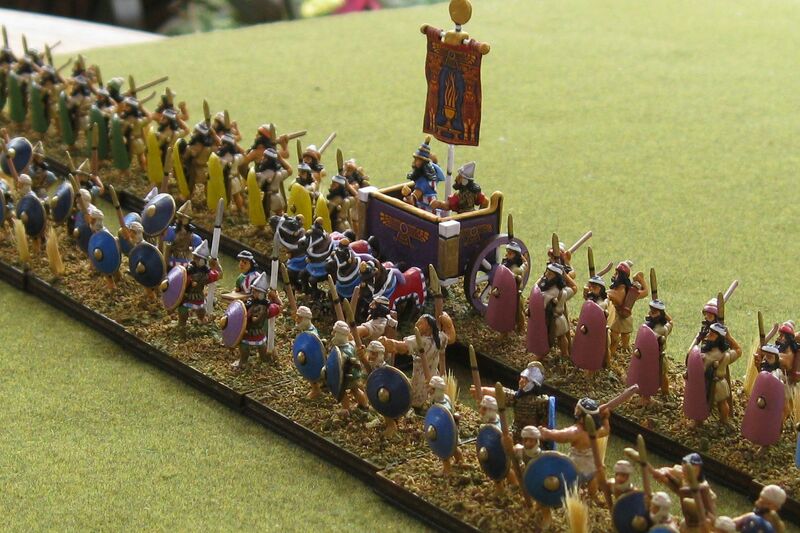 The hordes to the rear were constructed from various leftover figures , including quite a few Athenian rowers! The cavalry look especially pretty and I like the way the banner turned out (based on an illustration of the god Hanuman that I found on the web). Unfortunately as irregular CvI, they are good for little more than guarding the baggage. 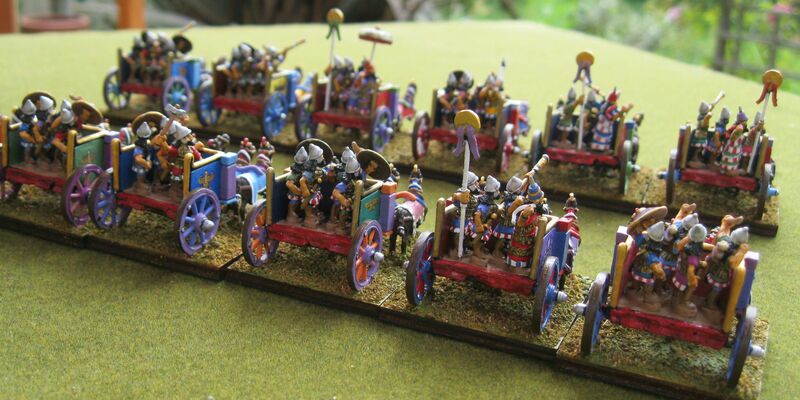 I had fun painting the chariots – probably got a bit carried away with a bit too much colour. Mind you, having seen some of the painted lorries on modern Indian motorways, it wouldn’t surprise me if they were painted as gaudy as this. I also rather liked the general’s ‘Grumpy Elephant’ banner. 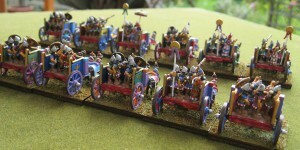 Hopefully the massed chariots at least look intimidating to any likely opponent.. 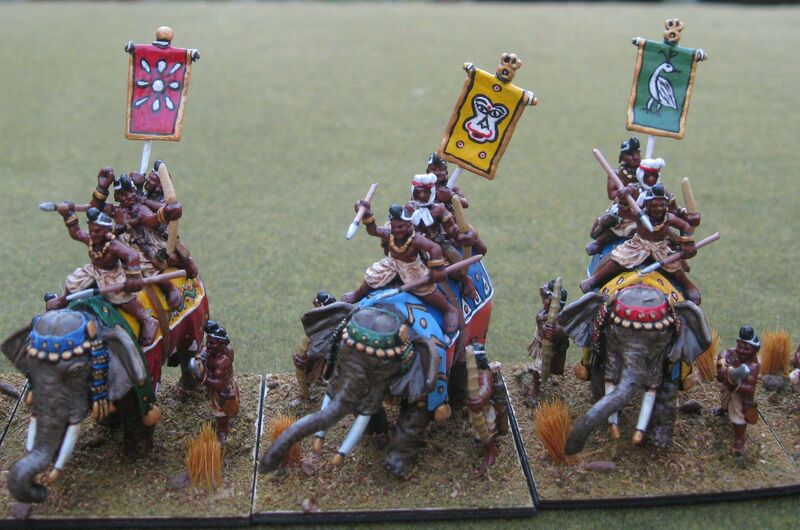 Elephants, got to have a lot of elephants in any Indian army…. 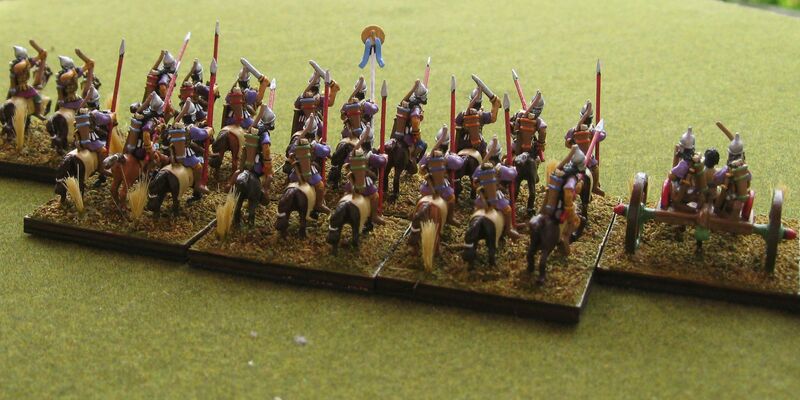 These have three crew on top and bowmen/swordsmen below- definitely El Superior. The Xyston elephants are quite nice, but have long trunks and won’t quite fit on a 40mm square base – hence the diagonal pose. 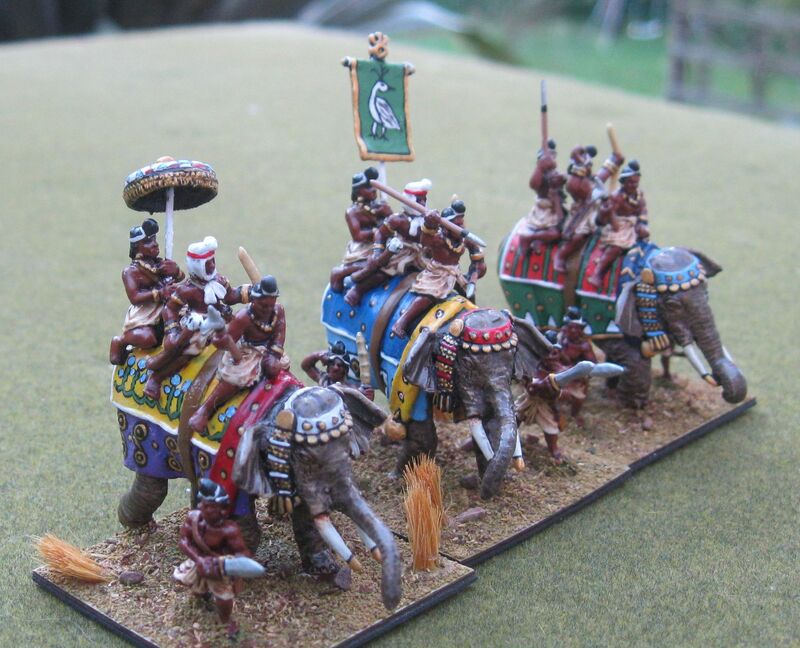 A general’s elephant with the parasol..
More infantry. The archers on the left are the more typical indian type (with fewer clothes). 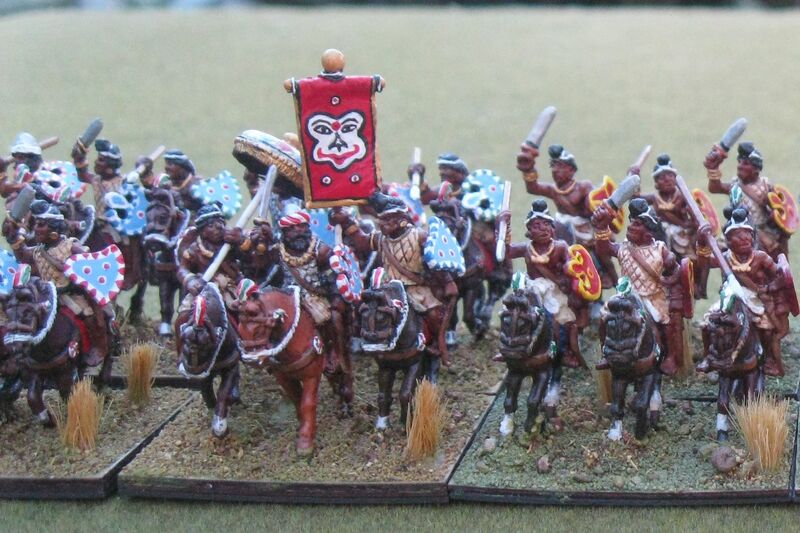 The shielded infantry are irregular BdI – shields decorated with various Harrapan/Indian symbols gleaned from Omniglot. That’s it for now. I’m currently trying to finish up my Han Chinese army ready for 2014. 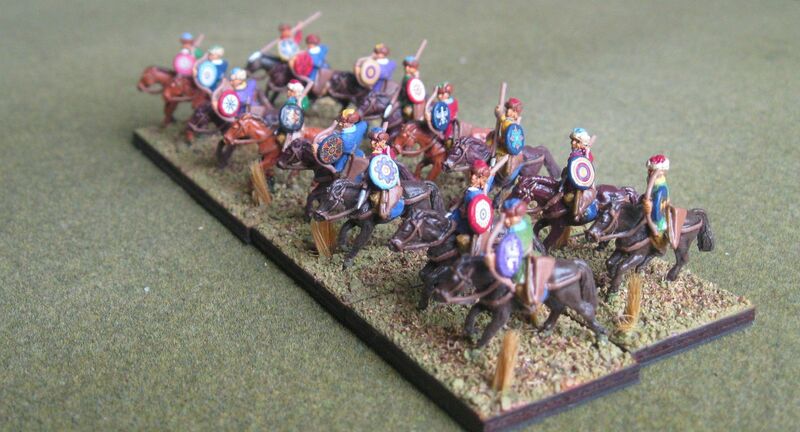 Also re-vamping my Carolingians. Will post pics in the nearish future. Once again I completely forgot to take any photographs this week, which was a pity, so instead here is an account of my games at the Guildford 1-day DBMM competition last weekend. As usual, I forgot to take any photographs, but I will do some of the army itself at some point. A cracking time at the Guildford on-day competition last Saturday, especially since I came away with two trophies. The competition was a Book 1 theme and the army I took was Libyan Egyptian, chosen because I hoped that in a one-day format it would have the necessary win big/lose big to get the number of points that normally seems to be required to do well at a one-day competition. My normal Book 1 army is New Kingdom Egyptian, but I think that it is too susceptible to long fought out draws and lacks a punch, which can work over 4 rounds, but I think leaves you in the middle of the pack in a two round comp. Command 1: Reg Cv(S) C-in-C, 6 Reg Bd(O), 9 Irr Wb(S), 4 Reg Ax(O), 4 Reg Bw(I), 18 Irr Ps(I), 4 Irr Ps(O). Command 2: Reg Cv(S) Sub, 8 Reg Cv(S), 2 Reg LH(F). Command 3: Reg Cv(S) Ally, 18 Irr Wb(S). Baggage Command with 6 Irr Bge(I). The first game was against Ch’u Chinese (Western Chou and Spring and Autumn Chinese). My opponent was Oren Taylor, who I hadn’t played before. We found ourselves invading China in summer. The only relevant terrain was a waterway on my right flank, then a 5 base width gap, then a patch of rough going, then a 6 base width gap then a rocky hill. 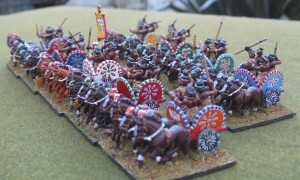 The Chinese formed up first. On their right on the reverse slope of the rocky hill was a large block of Reg Pk(F), with a chariot general behind and an Expendable on the far flank. In the centre, also behind the rocky hill was some more Irr Pk(F), then a line of Ps(O) in the open, with two Reg Kn(O) chariots behind them, then another block of Irr Pk(F) facing off against the scrubby flat, then some Irr Kn(O) chariots, then the waterway, which had 4 Bts(I) on it. I deployed with the main mass of the Wb(S) facing the hill, flanked by the Wb(S) from Command 1, then a line of Bw(I) backed by Ax(O) in the open, facing the Ps(O), then the Bd(O) in the rough facing the Pk(F), backed by the huge block of Ps(I) and (O). The chariot command was deployed as a second line. Oren took the first bound, and his ally general, in the centre, was unreliable. This constrained his C-in-C, on my left, who had to use 3 of his five PIPs to try and activate him. He used the rest to advance the Pk(F) in his command over the brow of the rocky hill, and to move the elephant Expendable up on the flank. On his left, he expanded the Kn(O) from column into line and advanced the Pk towards the scrubby flat. My ally wasn’t unreliable, so I advanced all the Wb(S), from his command and the C-in-C’s, up onto the rocky hill. At the outside end we were matched up, by on the inside I had an overlap because he hadn’t been able to move up the Pk(F) belonging to the unreliable ally. On my right I advanced the Bd and Ps into the scrub, and the line of Bw(I) in the centre. In the reserve line, the LH went left to deal with the Expendable, while the Cv(S) went right to face off against the Kn(O), which was a daunting prospect for them. On his turn he was unable to activate his ally, so just continued to develop his attack on his left and moved the expendable forward, spending 3 PIPs again to try and activate his ally. On my turn, I continued the general advance, halting in the centre to avoid activating the ally. My Ps(I) started skirmishing with a screen of Ps(O) that we in front of his Kn(O). On Oren’s turn he again failed to activate his ally, but did reveal an ambush of Kn(S) behind the rocky hill. The Ps skirmish continued on the right flank. The expendable attacked my LH(F) impetuously and imploded. On my turn I decided to attack before the ally got involved, even though it meant activating him. 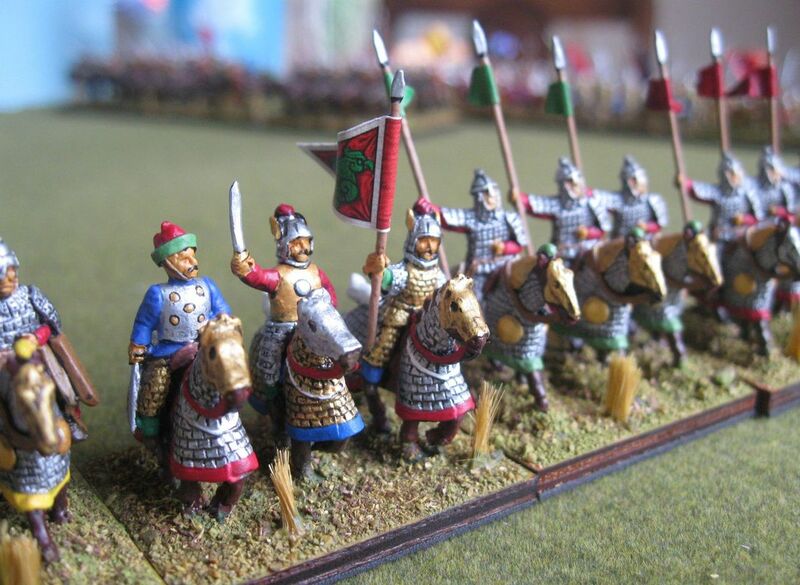 The warband ploughed into the pike on the hill over a frontage of 8 elements, and, starting at the end with the overlap, won the first 6 combats (or drew, and converted them to wins with the S bonus). The last two lost and recoiled, but that was still 12 Pk(F) dead and 12 ME off that command. 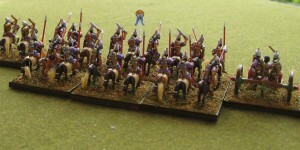 The blades charged into the pike in the scrub, but couldn’t achieve the same effect, killing no-one. The centre advanced and shot at the Ps(O), breaking them up. In Oren’s turn, he drove the Wb(S) that had already recoiled further down the hill and fought the others, bring up the rest of the ally Pk(F). His chariots in the centre came forward to fight the bowmen, and also advanced by the waterway. The Kn(S) worked their way around the hill. 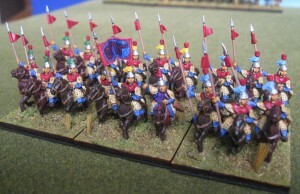 In my turn, the warband continued to mop up Pk(F) on the rocky hill, including some of the ally ones. The blade also started killing some pike in the scrub, and we traded Ps on the far right. In Oren’s turn his chariots came in in the centre and killed one of the bow, but another one fled from them. 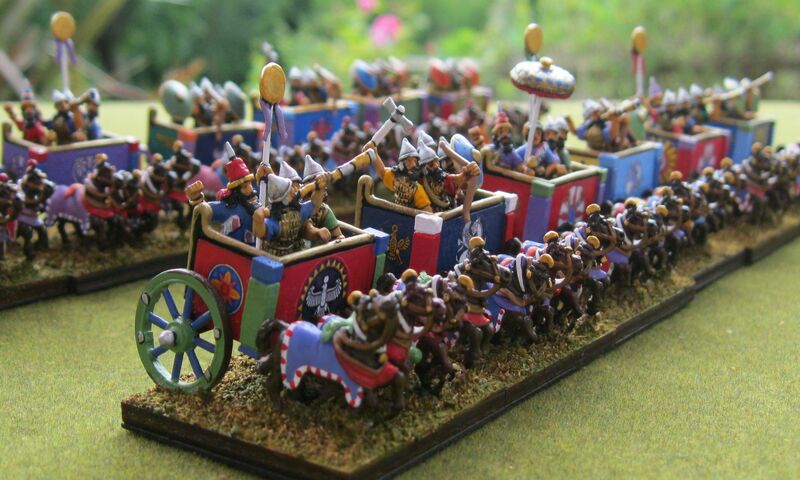 The chariots on his left also advanced, but their formation was at right of getting disrupted by their own Ps in front of them. The pike on the rocky hill killed four Wb(S). On my turn I was able to turn some Wb into the rear of the winning pike blocks and send up the LH to provide overlaps as well. On my right, the Ps protecting the flank of the line of chariots had been killed, so I was able to throw a Ps(I) into the flank of the Kn(O), with another as an overlap. The Wb killed the remaining Pike on the hill which broke that command. The Kn(O) who had killed the Bw also died because his wingman had fled so he had been hard flanked. On the right another Pk died, and the Kn(O) who was flanked by the Ps and couldn’t recoil also died on a 6-2 (becoming 8-4). This, plus the broken C-in-C’s command came to more than half the army, and it broke. My loses were 4 Wb(S), 1 Bw(I) and 1 Ps(I), making it a 25-0. Oren was very unlucky that his ally was unreliable and that prevented his C-in-C from using his PIPs to get the Kn(S) out from behind the hill. As it was the best troops in his army fled without ever having fought. I was lucky that the uphill attack on the Pk(F) was so successful, but a lot of that was down to the S bonus breaking the draw. My second game was against Steve Bainbridge with Neo-Assyrian Empire. This time I defended and we ended up with a very cluttered battlefield, with the waterway down my right flank, with a rocky flat next to it, and then an enclosed field about 8 base widths away and running all the way back to my base edge at an angle. I had to either split my army or deploy it all on one or other side of the field system. I opted to deploy it all between the fields and the Nile, with the Wb(S) in column on the rocky area, as close to the edge as they were allowed, then the mixed foot of the C-in-C, then the Cv(S) chariots crammed in next to the field system desperately trying to fit in. Steve couldn’t or didn’t deploy his army only facing me. On my right was a line of supported Ax(S) with some LH(F) on the flank, then three Kn(O) chariots, then his Libyan Egyptian ally (turncoats, collaborators) with Wb(S) and some Bw(I), then more Kn(O), then another Ax(S), then more Kn(O) then some Ax(O) and Ps(O). But this point though, that flank of his army was facing empty space and the field system. My initial PIPs were good so I expanded out my Meshwesh as quickly as I could to try and fill the gap to the Nile before Steve sent his LH(F) around it. In the centre we advanced, although I tried to bring my Bw(I) and Bd(O) across from the right to the left to face the Kn(O). On the left, I was tempted by the extra PIPs to throw my Cv(S) out as wide was possible to try and roll up his Ps(O) and Ax(O), who looked weak. However I managed to restrain myself, and reminded myself that most bounds they wouldn’t get 4 PIPs, but only 1 or 2, so it wasn’t a good idea to start on a complex plan. Instead they braced themselves for the onslaught from the Kn(O) and deployed to stop themselves being outflanked. Both sides then advanced for a general ding-dong. We hit first in the centre, and basically it didn’t go very well, as the Kn(O) ground their way through the Wb(S). My Cv(S) kept fleeing from Steve’s Wb(S) as well, and I was getting pretty desperate holding them up flinging Cv(S) and Bd(O) back in, although I did kill a couple of Wb(S) with Bd(O). The Bd(O) were also having a rough time from the Kn(O), as were the Bw(I), although they held on longer than I expected. The Ax(S) in the rocky area also held on well, until suddenly they started crumbling, and of course didn’t have any reserve ranks to plug holes, so started being hard-flanked and losing even more. By this time my centre was disheartened though, then broke, and it looked like it was all over, as the Cv(S) on the flank were completely broken up and had Kn(O) bearing down on them. However, I decided to keep going and see how many victory points I could salvage from this, to try and deny Steve a complete victory. In order to stop the Wb(S) on the right flank, Steve had to throw across all the ancillary troops from the ally command, including its general, in order to form a new line at right angles behind his main line. These were troops like Ax(O) and Bw(I) though, that weren’t happy fighting Wb(S) and they rapidly went down, disheartening the ally command. The right hand command that the Ax(S) had been in was also disheartened, so I was looking at at least 4 victory points back here. On my left, Steve’s Kn(O) were caught in a colossal traffic jam, and the few Cv(S) that were holding the line were fighting heroically, including one that was flanked and contacted in the rear and still threw his opponents off, then survived another rear attack from an Ax(S). Steve was getting increasingly frustrated by this, especially when in desperation I threw a Cv(S) into a Kn(O) there and the Cv(S) ally general into a LH(F) on the far right flank, which was a very desperate move by me as it exposed his flank to another LH(F) if I didn’t kill it straight off. The Cv(S) killed the Kn(O) with his S bonus, and in my jubilation, I didn’t realise that we hadn’t fought with the Cv(S) general on the other flank. Just as Steve was about to roll his PIPs I realised, and stopped him long enough to resolve it. The result (4 vs 2, S vs F) was fortunately predictable, and the LH died. Steve checked and this was enough to break his right command. The 2 ME from that was enough to break the Libyan Egyptian ally, and those two commands, plus the casualties from the intact commands, was enough to take him 1 ME over his army break point. From a point about an hour earlier where my army was in deep trouble, I had managed to dig in and turn it around, although I had lost well over 40% of my army myself (42 ME out of 90). So Steve was able to grab 8 victory points from me, but that was unfortunately scant consolation for a game which had looked like a 23-2 is his favour an hour earlier. To my surprise, 42 points were enough to get me first place, and a solid win in the afternoon from Adrian Coomb-Hoare and two good performances from Dave Mather were enough to get the strangely named West Pinnergate not by the Sea team the team prize as well. Unfortunately in all the excitement I forgot to take any photographs of the battles. 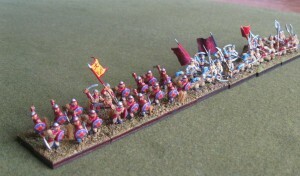 For my first post I thought I’d add some pictures of the Assyrian army I used against Toby this week. 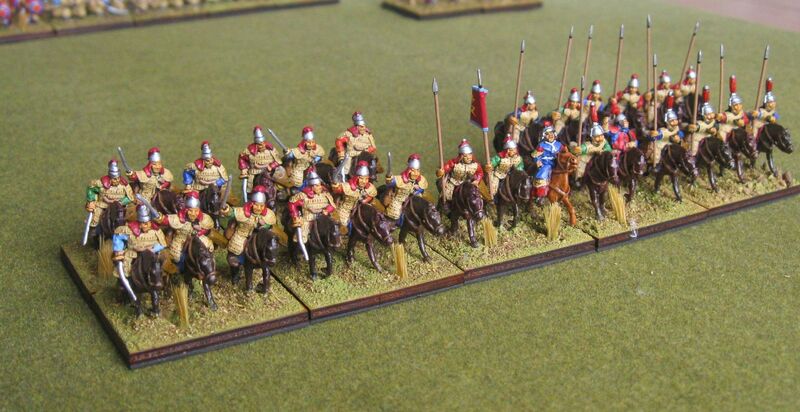 I’m still working on a 400pt version of this army – previous incarnations have done well at Britcon but very poorly at the Italian ITC. 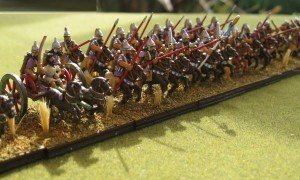 I’ve recently been using it for doubles at 450/500 pts where I think it performs better – particularly with a Mede Ally. 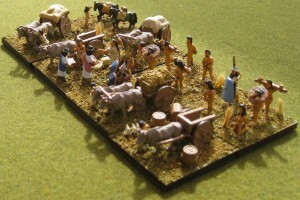 The figures are almost all from Museum Miniatures. I like the figures but they suffer from generally having only a few poses. Replacing cast spears with pins, mixing what figures they have and painting uniforms in various shades helps break up the mono-pose appearance a bit. Firstly the cavalry, sweeping down on some unfortunate fold…. 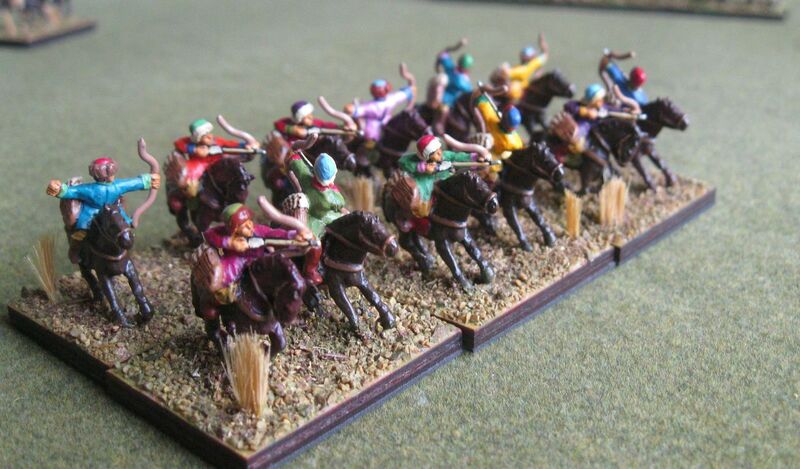 Flanked on one side by a Kallipani chariot (AxS/PsO)and on the other by some light horse archers (LhF) and lead from the front by General Sin-shumu-lishir. Rear view of the same group. The Assyrian Divine Chariot, flanked by the massed hordes of the Dikut Mati. The front ranks of each element are the Museum Babylonian and Judean spearmen. The second ranks are a mix of biblical figures scrounged from friends. 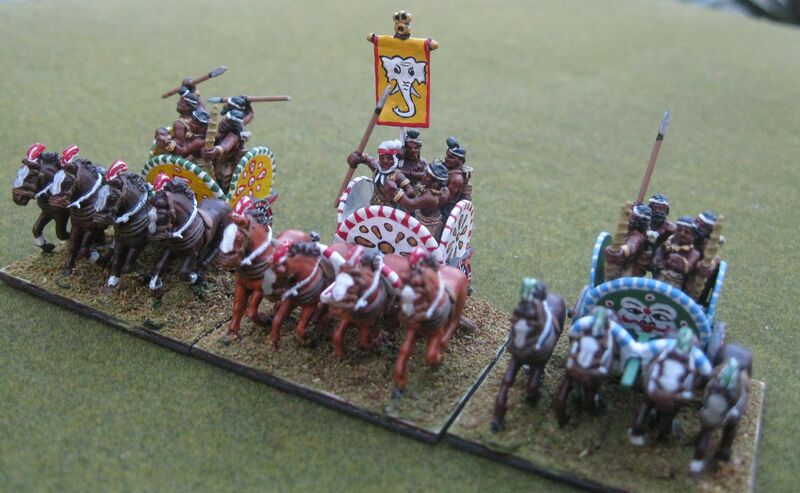 The banner is from the Little Big Man Sassanid transfers. King Ashurbanipal about to do some serious smiting beneath his fancy umbrella…..
Crown Prince Ashur-etil-ilani ‘protecting’ his father’s flank…..
We meet on Wednesday evenings most weeks of the year. There is normally someone unlocking between 7pm and 7:30pm and we play on until around 11pm. The nearest tube station is Northwood Hills (on the Metropolitan line) and there are nearby bus stops for the H11 bus. Please fill out the form below if you have any questions.